ParkVia have just launched an app. Now booking all of your favourite airport, port, train station and city centre car parks is just a few taps away on your smartphone. The user-friendly interface makes it a breeze to compare the car parks you want so there’s no scrolling through lots of complicated listings and the detailed information about each car park means you can choose with confidence. Find a spot near you. 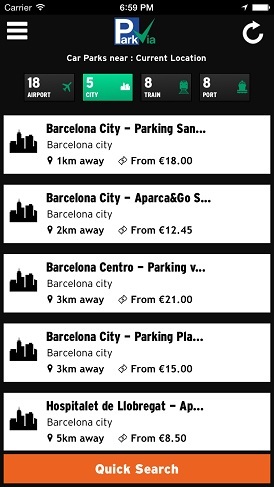 Look for car parks by keyword search or from your current location to reserve parking nearby. Tailor your search. Find the cheapest or closest parking. Keep your favourites. You can star your favourite car park and leave it in the main menu tab for later. So spend less time looking for parking and more time enjoying the things you love – download the ParkVia app today!